Driving a semi alone is already dangerous. When you add a little snow, ice and any other winter elements you may have to deal with, your safety is on a whole new level. Winter weather driving tips apply to us all. Whether you have been out on the road for thirty minutes or thirty years we will try to help you remain safe out on the road during the crazy winter weather season. The experience that I have gained has come from driving winter weather seasons in places like Montana, Wyoming, Idaho, Utah, Oregon and Washington. Some of the biggest winter storms I’ve seen was when I was driving for Walmart. I have traveled the entire lower 48 states and have seen some crazy ice storms, wind storms, blizzards and hail storms as I am guessing a lot of you experienced guys have too. 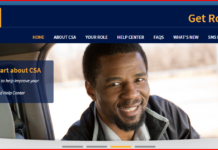 I believe that even more experienced truck drivers can benefit from a gentle reminder from time to time, I know that I sure can. We must not get complacent especially in this season of higher danger. I hope that we can all look out for one another to remind each other as much as possible to take our time and be careful. Learning how to drive in snow takes time and patience, you’ll eventually get the hang of it. Now, we’re not going to get into the common driving hazards, like staying awake driving or things you learned on your CDL test. Rather, we’re going to keep it specific to winter weather. 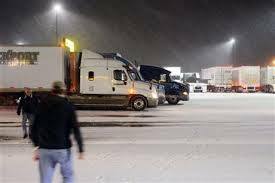 The most common dangers for truck drivers when it comes to winter weather driving are freezing temperatures, frozen roads, snow, ice, freezing rain and high wind gusts. We will be discussing what you should be looking for when these conditions are present. 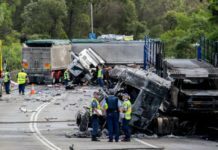 We will also mention what safety items truck drivers should carry in their tool bag as well as some survival gear, just in case the road is closed for awhile. Last, but certainly not least we will be giving you our driving tips and tricks when it comes to safely navigating winter weather conditions. 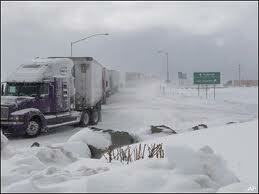 Let’s first discuss the different winter weather hazards and what they can do to affect us as truck drivers. The first sign of winter weather conditions is when you see the thermometer in your truck fall at or below 32. This is the point where water freezes and where snow could possibly stick to the ground. If the sky is clear and the ground is dry I wouldn’t worry too much when the temperature hits 32 degrees. However, if the temperature drops below 25 degrees and you are going to shut your engine off for any length of time you will want to add some anti-gel to your fuel tank. If it dips below 32 degrees and the ground is wet you need to start looking for spray off of tires, you can check in your side mirrors at your own tires or look at the cars that are passing. 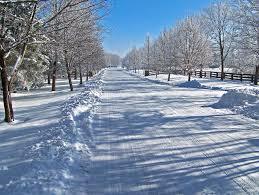 If you see spray that means that the road you are on is well traveled and not quite frozen. If you don’t see spray you need to assume that the ground is frozen. If you add high winds to ice covered roads the weather is setting you up for a disaster. Remember, if you are too uncomfortable to drive and you don’t feel safe, find a safe spot such as a truck stop or a rest area and pull over. One of the worst conditions you could face while driving is a light snow that is falling on top of ice, such as if freezing rain iced up the road and then it got cold enough to snow. If you are crazy enough to go out in winter weather like that make sure you bring your chains and your lucky charms. Now we want to review some basic survival items for winter weather driving and other tools that would be handy to you in a winter weather situation. The first think that you need to have on your truck is a good set of tire chains. 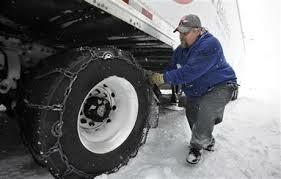 You should have enough chains for all of your drive tires and a couple singles for drag chains on trailers. You will not always use all of the chains and depending on the differing state laws you will have to use different configurations. 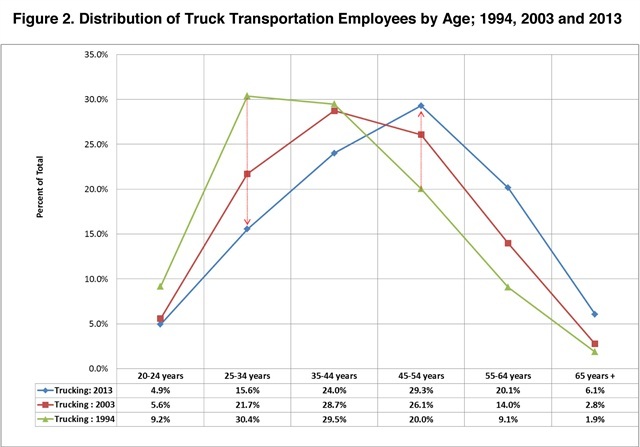 The Truckers Report has a good reference tool here http://www.thetruckersreport.com/chain-law-information/. There are many states that require a semi truck to have chains on through their winter weather season, don’t be caught without them or you can get a big ticket. The next piece of gear that I have in my truck is coveralls and boots so I don’t get my regular clothes messed up. And certainly don’t forget plenty of extra bungee cords for those chains. In winter weather conditions I like to keep my fuel tanks full just in case I run into a closed road or get stuck. You never want to bypass the truck stop at the bottom of the hill when you are getting close on fuel for the one just over the hill. Some other items of interest are, a bag of salt (to throw under your tires in a dock), some anti gel additive, extra food, extra clothes, extra blankets and extra water. Like we mentioned, if you get stuck in a winter storm or the road closed you would hope that you have enough fuel to play the xbox, however if you run out of fuel all of these supplies will help you survive out the cold weather conditions. Lastly, lets get down to some actual practical winter weather driving tips. We already talked about what to look for in regards to the spray coming off tires. You should also look for a darker color to the asphalt, look for water built up in the rumble strips and if your lucky enough to be driving when it is light look for flags or trees waving so you can tell if its windy. Now if it is windy and icy and snowy what can you do to improve your chances of staying out of the ditch? The first thing I always tell people is to drive within their abilities and comfort zone. If you have never ever driven in snow or ice and it’s a straight up blizzard you come into, you need to find a safe place to pull over, period. If you have some experience or you are trying to “get your snow shoes on” as we like to say, you need to slow down to a comfortable speed, don’t get real deep in the throttle and turn your jakes to the lowest setting or completely off. Increase your following distance and try to get away from the packs of traffic. This way if something does happen you have space to react. Do not over counter steer, as in backing think a little to the left or a little to the right. Turn the wheel the opposite direction of the skid slightly and be ready to turn back. Always leave something left in the throttle, if you always have a little more peddle in your throttle you will be able to accelerate out of the start of a slide. You’ve always heard that bridges ice before roads, have you heard of “floating a bridge” in bad weather driving conditions? This is when you are approaching a bridge you let off the peddle a little bit, then once your drives have passed over the other side of the bridge you slowly accelerate off the bridge, this pulls your trailers through. 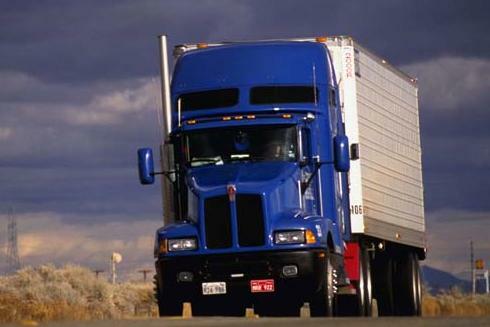 Remember, never over steer, do not move the wheel in micro movements back and forth, be as steady as you can. Do not put the brakes on abruptly, if sliding when applying the brakes, gently tap the brakes over and over again. Give yourself time to slow down and give yourself an out. Do not accelerate too fast, slow and steady wins the race. And lastly, do engage your inter axle differential when you get into bad weather especially when going up hills. 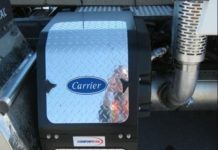 There are different ways to engage the differential so check your owner’s manual for the best way for your truck. Hopefully we shed some light on some of the ways that will help you in your winter weather driving endeavors. Winter weather can be very hazardous but, if you know what you are doing it won’t slow you down too much. Always remember if you are not comfortable, too scared or feel that tingle in the back of your neck that you get when you are riding a roller coaster, get to a safe spot and pull over. 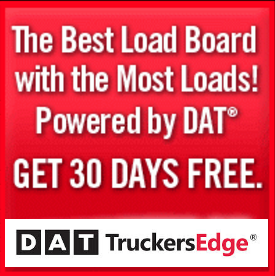 It is better to deliver the load late than to not deliver the load at all and possibly lose your life in the process. As always if you have any suggestions, comments or questions about winter weather driving please let me know and be safe out there!